Hummingbird baffles shade the hummingbird feeder from the sun so the hummingbird nectar stays fresh longer and the rain won't wash contaminates into its bowl. 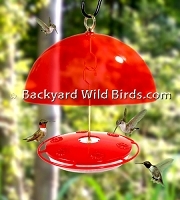 The bright red color domes can also attract the Hummingbirds to the feeders. They all work and they do compliment their Hummingbird feeders and your backyard. Hummer Helmet and Hummingbird feeder with 6 ports gives good nectar protection from the sun and rain. Hummer Helmet is a Dome to attract Hummingbirds and to keep Hummingbirds nectar fresher longer. Add to the beauty of your backyard Hummingbird feeders with this functional Dome. Note: Hummingbird feeder sold separately. 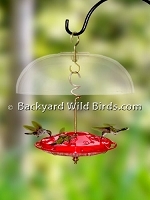 HummZinger Fancy Rose and clear dome baffle is a hummingbird feeder with style and function. The 12" dia. dome shades the hummingbird feeder from the weather so the hummingbird nectar stays fresh longer. 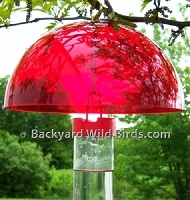 Hummingbird Feeder and Red Dome has a big 10" red metal dome for shade is an excellent Hummingbird Feeder. 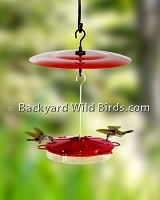 This 6 port Hummingbird Feeder combination has style and function. Hummingbird Feeder is designed with built-in ant guard and bee deterrent.